Bringing affordable, reliable broadband Internet access to those who lack it has become a strategic focal point for high-powered telecoms and high-tech corporations and executives – whether it be in the rural US or isolated towns and villages around the world. 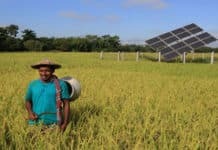 Multinational corporate giants, such as Microsoft, are investing in promising, developing-world solar energy start-ups and entrepreneurs in order to lay the foundations for both universal clean energy and broadband access. Launched in July 2017, the Microsoft Airband Initiative has been joining forces with local Internet service providers (ISPs) with the aim of delivering broadband access to 2 million rural Americans by 2022. Several small-scale projects are under way, and Microsoft Airband Initiative is working with several ISPs to realize larger scale deployments, according to the program’s Senior Director Paul Garnett. 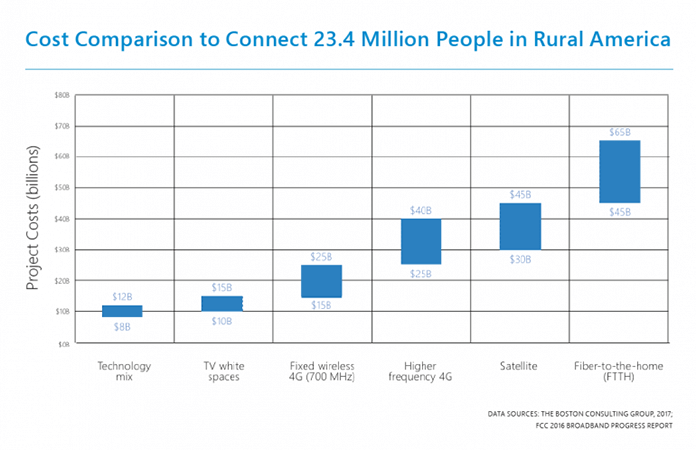 Cost Comparison to Connect 23.4 Million People in Rural America. | Credit: Microsoft. | Data sources: The Boston Consulting Group, 2017; FCC 2016 Broadband Progress Report. Microsoft Airband Initiative is working to close the digital divide overseas, as well. In August, program managers awarded grants to three African start-ups that are bringing both solar energy and broadband access to off-grid households and communities. The winners of the third annual Microsoft Airband Grant Fund – Nigeria’s ColdHub, Rwanda’s MeshPower, and Kenya’s Agsol – brings the total number of Microsoft Airband grant partners in Africa to 19. The International Telecommunications Union (ITU) estimates that some 3.5 billion people worldwide lack Internet access. The World Bank estimates that some 1.3 billion – 600 million in Africa – lack access to electricity, Garnett highlighted in an interview. Declining costs, improved performance and fast-growing markets and industry are fueling growth of innovative distributed solar energy solutions and start-ups worldwide. The growth of mobile pay-go solar start-ups, and more recently solar microgrid developers, in Sub-Saharan Africa offers a case in point. Support from national and multilateral government policy initiatives, programs and public-private partnerships are creating an institutional framework for sustainable development and growth. “Without connectivity or electricity, communities are unable to take advantage of the benefits of the Internet, which is critical for education, healthcare, farming and participation in the 21st century economy,” Garnett told Solar Magazine. The Microsoft Airband Grant Fund provides access to financing, technology, mentoring, networking opportunities and other resources that help start-up partners scale and expand deployment and use of their technologies, services and business models, Garnett explained. A total of eight early-stage companies received Microsoft Airband Grant Fund awards this year, the third, consecutive year grants were awarded. The start-ups are bringing affordable, reliable, solar-energy services and Internet access to off-grid and under-served communities in Africa, Asia and the US. Three of this year’s grant recipients hail from Africa. Agsol manufactures solar powered agro-processing machines for off-grid farming communities. In addition to providing the electrical energy for equipment that processes staple crops such as maize flour, milled rice, and grated cassava, excess power is used for lighting, phone chargers and small appliances. ColdHubs is transforming their refrigerated crop storage rooms in Owerri, Nigeria into Wi-Fi hot spots using TV White Spaces (TVWS) technology. More fundamentally, the company aims to empower smallholder farmers by giving them the opportunity improve their livelihoods. Globally, smallholder farmers grow most of the fruits, vegetables and other crops consumed by people and livestock. It’s estimated that some 470 million smallholder farmers lost 25 percent of the value of their crops annually as a result of food spoilage, however. ColdHubs’ solar-powered crop storage facilities help reduce food spoilage. Farmers who use ColdHubs can extend the freshness of their fruits and vegetables from two to about 21 days and reduce post-harvest loss by 80 percent, Microsoft Airband highlights. 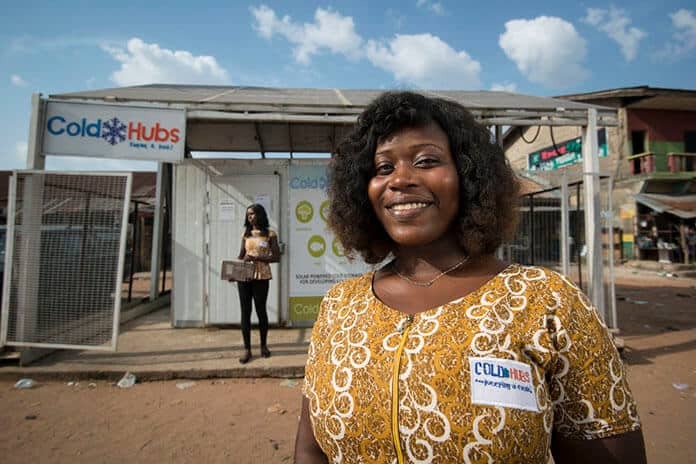 ColdHubs also is helping close the digital divide by turning its cold-storage facilities into Wi-Fi ‘Farm Connect Centers.’ Farmers are able to access the Internet and gain access to agricultural training, resources to improve crop yields and marketing and digital skills training. 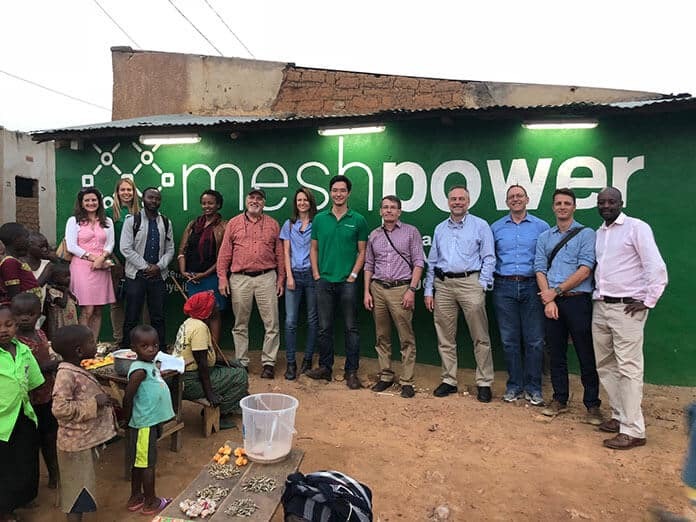 Developer of a solar-powered, 48-volt, DC microgrid platform, Kigali, Rwanda-based MeshPower provides energy to off-grid regions. 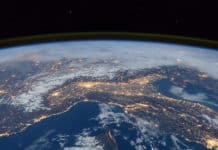 Built-in Internet connectivity enables MeshPower to deploy, monitor and manage the microgrids efficiently at a fraction of the cost of traditional energy access solutions, according to Microsoft Airband Initiative. All told, 30 companies in more than 20 countries have been awarded Microsoft Airband grants. Previous year’s grant recipients include Kenya’s SunCulture, Uganda’s New Sun Road, Nepal’s PicoSoft and Indonesia’s Electric Vine. 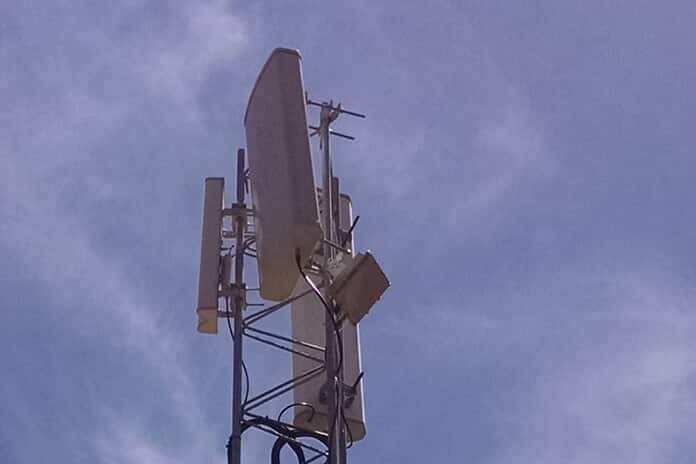 Other recipients in Africa include Ghana’s Spectra Wireless, Democratic Republic of Congo’s VisionNet, Ghana’s Spectra Wireless, Kenya’s Mawingu, Malawi’s C3, Namibia’s My Digital Bridge and South Africa’s iSizwe. Microsoft also has partnered with Kenya’s M-KOPA, a market-leading solar energy company spun off from mobile payments service provider Safaricom’s M-PESA, that’s using cloud services, smart metering and m-payments technologies to deliver affordable, pay-as-you-go clean energy to 700,000 homes. Bangladesh’s ME Solshare also received a Microsoft Airband grant this year. Four US start-ups did as well – New York’s CV Wireless, West Virginia’s Skylark Wireless, California’s Tribal Digital Village, and Numbers4Health, which is bringing broadband access to under-served rural communities in Texas, Maine and Compton, California. Each of the recipients will use TV white spaces and other technologies to extend “last-mile” access to the Internet. Bridging the digital divide is a focal point for the ITU, as well. Earlier this month, ITU members said they intend to deliver Internet access to the 2 billion of the 5 billion mobile network subscribers worldwide who lack it.